Gernot Rohr’s latest Super Eagles squad has prompted more groans and moans of unhappiness than usual, even if Nigeria are only set to face the Seychelles. It’s quite hard to know which is the supporters’ biggest gripe, although there are several that catch the eye, even if Rohr can’t really be blamed for Victor Moses’s decision to call time on his international career. The decision to opt for Jamilu Collins and Semi Ajayi despite the fact the duo spent last season in the third tiers of Germany and England respectively, for example, hasn’t gone down too well, with many questioning whether the duo have the talent to contribute to the Nigeria project. I don’t understand Gernot Rohr’s rationale for inviting a third division player to the Super Eagles when quality abounds in the NPFL. The national team should not be a recycle bin. Elderson Echiejile’s omission may be a nod to a Super Eagles future, but Joel Obi and, particularly, Ogenyi Onazi’s ongoing presence in the squad hasn’t gone down well. Nor has the persistence with Odion Ighalo, whose World Cup misses against Argentina are still fresh in the memory, despite a lack of viable alternatives. John Obi Mikel, Tyronne Ebuehi and Moses Simon’s absences due to injury, coupled with Moses’s abdication, deny the Eagles several of their key on-field talents, while the form of Kelechi Iheanacho doesn’t inspire much confidence that he can offer much as a creator or a goalscorer. His[@ighalojude] continued inclusion has led to some backlash, but there simply is no denying the strategic importance of the China-based striker! Then again, it’s only Seychelles, and Nigeria don’t need to be at their best—yet—to avoid another Africa Cup of Nations absence. However, amidst the extensive negativity, the return of Henry Onyekuru ought to boost the beleaguered Nigeria fans who still remember—all too readily—how the West Africans were eclipsed by Croatia this summer. The 21-year-old wonderkid missed the trip to Russia after suffering a serious knee injury in December. Despite returning to training at Anderlecht in April, the Belgian giants opted not to use him again until the season’s end, and the chance to make a late impression on Rohr was lost. As well as denying Onyekuru a spot in Russia, the injury also curtailed another promising season, fuelling the sense that people haven’t actually realised quite good the versatile wideman is yet. After truly breaking through in the 2016-17 season with KAS Eupen, when he was top scorer with 22 goals, the youngster was signed by Everton for £7 million. The Toffees sent him back on loan to Anderlecht, where he’d already scored nine — despite featuring in an unfamiliar left wing-back role at times — before injury struck. It’s a sensational goal return, particularly for a player who’s found himself, at various times, adapting to a new position or club. His fine form has continued this term, where Onyekuru, now on loan at Galatasaray, has made it two goals in his last two. His effort in the 6-0 demolition of Alanyaspor last Monday followed on from his winner over Goztepe, and he’s settled into life in Turkey—and with a Super Lig giant—seamlessly. Of course, it’s Onyekuru’s speed, dribbling, footwork and technical quality that immediately catch the eye, but the starlet’s goalscoring is so consistent—his season with Eupen is definitely no fluke—that he must begin to be considered as a valuable asset in the final third for Nigeria. Particularly considering the concerns about the identity of the national side’s leading goal threat, Rohr needs to find goals from elsewhere in his team, and Onyekuru offers just that. In terms of an option in the final third, is it even too premature to say that he represents an upgrade on rather than just a replacement for Moses?! Luis Suarez thinks Barcelona’s humbling Champions League exit to Roma last season can be blamed in part on too many players being tired from their win over Leganes in their previous game. Despite having won 4-1 in the first leg, the Catalans crashed out of their quarter-final after losing 3-0 in the return fixture in the Italian capital on April 10. Three days earlier, Barca had named a strong team for the 3-1 win over Leganes at Camp Nou, despite them holding a nine-point lead at the top of the table before the game. Suarez has admitted he went into the Roma trip feeling fatigued after playing 90 minutes of the Leganes match – something he hopes will not be repeated in 2018-19. “I really regret the game before against Leganes at home,” he told RAC1. “We had a big advantage [at the top] and in three days we had the [quarter-final] against Roma, but I played the whole game. Ernesto Valverde’s men kick off this season’s Champions League campaign against PSV on September 18. Mourinho will not be spending time in prison, however, as Spanish law states ‘that a sentence of under two years for a first offence can be served on probation’. The Office of the Prosecutor and the State Lawyers will ‘communicate in the next few days’ and ‘that they have already closed a compliance agreement’ according to the reports. The Spanish Footballers’ Association have reacted angrily against the announcement, however, threatening to strike if the match goes ahead. But despite the commercial attraction to hosting a game in an untapped market such as the US, German officials view the move as a “lack of respect”. “We will never play a league game outside of Germany,” DFL chief Seifert told Die Zeit . “That’s a limit we will not cross. “An official league game, which is about points that decide promotion, relegation or participation in the international competition, abroad, is, in my view, a lack of respect for their fans, the players and in the end also Major League Soccer. Relevent Sports’ chairman Charlie Stillitano is also the brains behind the International Champions Cup, the annual multi-country pre-season event. “You can rule out that there are as many kick-off times as there are games, as is the case in Spain,” he added. Relevent are keen on ensuring that next year’s La Liga fixture includes “one of the top five or six teams” but it remains to be seen if the arrangement will lead to an overseas game. “We are working with [La Liga] right now and nothing’s been decided. We just have to find the right game in the calendar and we want to do it this season,” he explained . “The other part will be that we want it to be that there’s not a cup game [in the week between] so there’s a little bit of rest for the players. 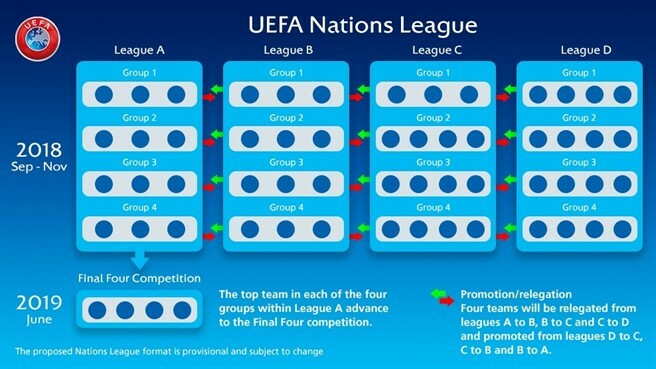 As the name suggests, the UEFA Nations League is a league competition for UEFA’s 55 members. It will consist of four different divisions (called ‘Leagues’) and three stages. In the first year, the four leagues will be decided on team strength according to UEFA’s coefficients, which are essentially their version of FIFA’s world rankings. The countries in three-team groups will play four games each, while countries in four-team groups will play six games – both in the normal home-and-away format. In League A, the winners of each of the four groups will advance to the ‘Final Four’ competition, which will take place in June 2019. To further incentivise teams to take the Nations League seriously, four ‘second-chance’ places at the finals of the continent’s biggest international competition will be up for grabs. It will work like this: by default, the winner of each League’s four groups will go into the play-offs. The four group winners from each League will play semi-finals and a final much like the Final Four, with the winner of each League’s mini-tournament qualifying for Euro 2020. Where it gets messy is if some of the group winners in each League have already qualified for the Euros through the normal qualification process – which they inevitably will have. If there is not enough unqualified teams in a League – again, this is very likely in League A – to fill the four-team play-off mini-tournament, teams from the League below will slide up to complete the field. These teams will have not qualified for their own League’s play-offs, though, so as not to punish the best teams in the League below by moving them up to a harder competition. For example, if there are only three unqualified teams for the League A play-offs, the fifth-best unqualified team in League B will join the League A play-offs – not any of the top four. Let’s map it out step by step. 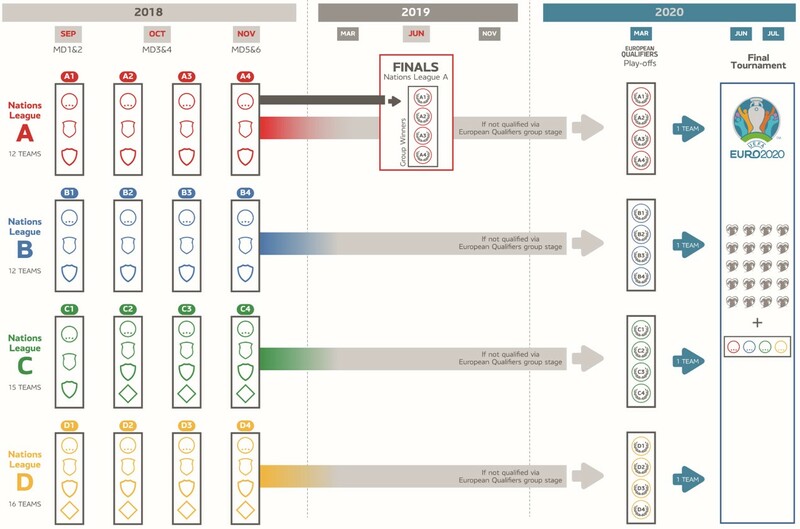 The Euro 2020 qualification play-offs are set for March 2020, and Euro 2020 itself – to be played across the continent – will begin three months later. None of this will require the international schedule to be changed; UEFA’s new structure fits into FIFA’s existing international windows. All of England’s qualifying matches through the 2018-2022 cycle – in both UEFA and FIFA competitions – will be broadcast live on ITV in the UK. England’s Nations League matches, however, will be available to watch on Sky Sports, who also hold the exclusive rights to the rest of the teams competing as well as the Final Four. In the US, ESPN has snapped up everything for the next cycle – Euro 2020 and its qualifiers, the Nations League and the European qualifiers for the 2022 World Cup.